just had a look on William Hill. Preston are 50/1 to make the playoffs but 33/1 to finish top six. we are 40/1 on both. Perhaps 'play-off finish' means you are predicting your team to finish in places 3 to 6.
i.e. you won't be paid out if they finish in top 2 unless you have wagered 'top 6'. Got £50 on @ 5-1 for a top half finish the day Jos was flushed. Underperforming side held back by his lack of managerial ability and the strange choice to freeze our best players out. There's a sort of cuteness to it really when you think about it. Seasons end when they finish and there is a very long way to go. You'd think they'd learn but they never will or do. Best of luck Sheffield United in what now is the year of the pig. 125/1 for a top six finish. Put that on about 10 minutes after Jos was sacked. Highly likely I’ve wasted a tenner, but I was half cut and skipping round the room with joy that he’d gone so I don’t care. BETFRED has 100/1 for us to be promoted this season. All the new found optimism is fantastic. I hope SB can work a miracle. I do think we need to keep a modicum of reality in mind though and give Steve the time he needs. 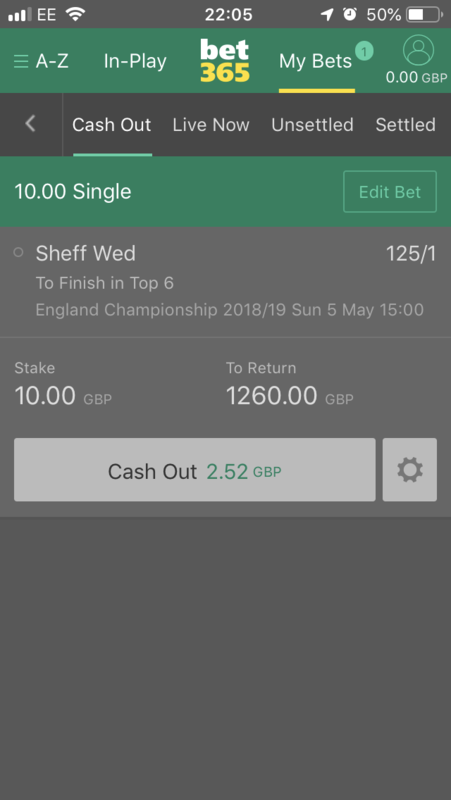 People putting a couple of quid on a long shot bet hardly means they’re booking hotels near Wembley. 9pts off playoffs with a game in hand and next 5 games winnable would say we have a chance of top 6 a lot better than the 40-1 odds but to have that chance of top 6 we need to score 2-3 goals consistently ,if we had a fit and firing hooper and a Antonio type in the side we would have a chance but sadly we have neither ,fletcher scores about 1 in 10 chances he gets missed several decent chances this season he should have nearer 20 goals than the 6-7 he has . but nothing is impossible and might as well have ago seen that we have seen relegation off what was certain under jos. Why would it a wind up if I was telling people to get on it at 5/1 then 7/2???? I'll give you a "like" if that's what your after. Think you might be right SOB2. Maybe gives the game away by offering a "like". Isn't that a term used on one of the Pig forums? Owlstalk prefers the "agree" (previously known as the plus) button. Def right about him being one of them and will give him the benefit re. his motives and let him enjoy his New Years Day. Gonna have a €5 double on us winning champions league in 2021 and Dave getting Ballon D'or. And Donald Trump not being a diick for 24 hrs. I expect Betfred has now panicked, and moved the odds to around even's now? We don't have a game in hand on the teams in 6th and 7th position. Whilst we do have a game in hand over the teams above us up to 8th that irrelevant in the context of a top six finish. Posted this in another thread but "Rescue bet"
is an anagram of Steve Bruce (minus the "v") I got 11/1 on promotion. It's written in the stars! !